Pro-abortion activists’ repeated claim is that pro-lifers don’t care about babies once they’re born. But they haven’t bothered to check the numerous ways pro-lifers show their love and compassion for babies and children every day. A way of life for many pro-lifers is providing foster care or choosing adoption. These are two wonderful options most people can use to give children a loving home – children who wouldn’t otherwise have one. The story of a Missouri couple is an amazing testament to the pro-life culture. Ron and Terri Robinson have been married for 40 years and amazingly have fostered more than 65 kids and adopted four. I had to do a double-take when I first read those numbers! A Baptist minister by trade, Ron says he and Terri believe God personally knit together each child in their mother’s womb. They are certain that each child bears the image of their Maker and deserves to be treasured and loved. Considering how their marriage started, however, it was far from evident they’d be married long enough to touch so many lives. Terri endured several rounds of chemotherapy, and even though doctors said her chances of getting pregnant again were very small, she miraculously gave birth to a daughter. More devastating news was just around the corner. Doctors found the cancer had spread to her lungs. Successive treatments of chemotherapy caused her cancer to go into remission, but she was told she would never be able to have children again. Years later, after they sent their son off to college, Ron and Terri felt that God was telling them they weren’t yet finished raising kids. 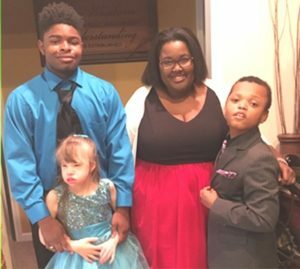 They obtained foster licenses and opened their home to children – especially those with special needs. While fostering continued to be a blessing, Ron and Terri found that more was in store. When the birth mother of McKenzie, a child they had been fostering for two years, disappeared, they were faced with the option of adoption. After much prayer, they made McKenzie a permanent member of their family. The process of adoption didn’t end there. McKenzie’s birth mom had another child, and Ron and Terri ended up adopting Jedidiah as well. Yet, God still wasn’t done growing their family. They then adopted Jesse, a four-month-old who Ron said doctors predicted would never “roll over,” “walk” or “talk.” After three years, however, Jesse began to communicate and walk, which prompted Ron to call him his “miracle kid.” When they returned to the “doomsday” doctors with proof their diagnosis was wrong, the physicians and nurses cried. Finally, Ron and Terri were called about a young girl, who they named Johari, with a very severe form of Down syndrome. She couldn’t talk, and when they first brought her home she didn’t allow anyone to touch her. But with love, compassion and lots of patience, that changed. Now, Johari climbs up and snuggles in Ron’s lap! There are over 130,000 children languishing in foster care – children who are eagerly awaiting a forever family through adoption. They aren’t just kids with special needs if that frightens you – although you should consider it. These are children who, for a variety of reasons, have not yet been adopted. If the idea of adoption has crossed your mind, going through the foster care system is a good option. If your nest is empty or near empty and you previously felt your child rearing years were behind you, consider doing what these families did. God may have a child already picked out for you and is just waiting for you to open your heart and home. Please go to our website and check out the resources on foster care and adoption and prayerfully consider these options. The love and compassion you show these children will change their lives forever – and yours too.